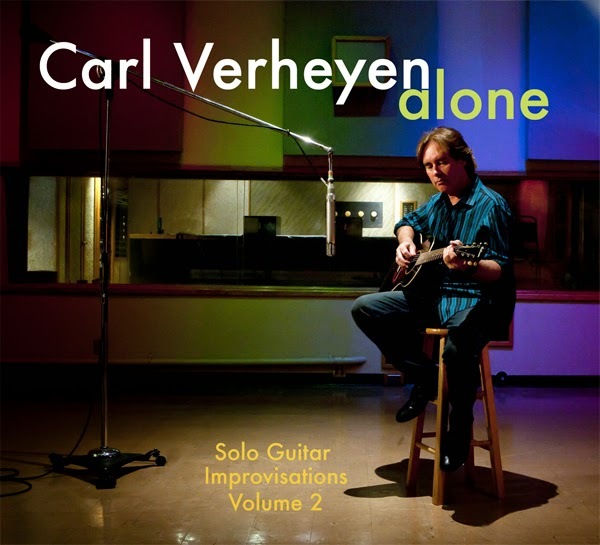 American guitarist Carl Verheyen recently released only his second acoustic solo album entitled simply "Alone." Carl is currently the guitarist for the rock band Supertramp and has been a part of the band since the mid-eighties. He is also an instructor for the Thorton School of Music of the University of Southern California. His last album "Mustang Run" (review here jpsmusicblog.blogspot.com) was a reminder of how good of guitarist Verheyen is and how he is able to support his own music with his incredible skills. This latest release features fourteen instrumentals including cover songs mixed with originals as Carl explained how many of these songs came from improving on the acoustic guitar. The album begins with the warm inviting tones of "Last Train Home" as Carl's playing keeps you focused on his performance. The gentleness of "Mercy Street" and the pure blues of "Good Morning Judge" shows the diversity in his skills, while keeping a common bond between the songs. He performs his trilogy of Beatles' tunes ("All You Need Is Love," "Norwegian Wood" and "In My Life") with "In My Life" the most recognizable as he changes tempos and chords on the other two, in order to show a different side to the songs. His beautiful rendition of "Going Home (Theme of the Local Hero)" is an easy flow in order to let your emotions get lost in it, while "Goodbye Yellow Brick Road" and "Over The Rainbow" are finally tied together in the perfect way. Carl Verheyen has a handful of dates in California, before heading over to Europe in July with live dates. To find out more about Carl Verheyen and his latest album, "Alone," please visit carlverheyen.com.